The story behind the name: Andromeda was the daughter of Cepheus and Cassiopeia, king and queen of Joppa, a country on the Mediterranean coast. 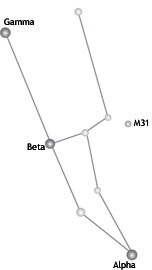 Queen Cassiopeia boasted that she and her daughter were more beautiful than the Nereids, the sea-nymph attendants of the sea god Poseidon and the sea goddess Thetis. Some stories say that both Thetis and Amphitrite, who was the wife of the sea god Poseidon (and in some places considered an alternate sea goddess) were also Nereids. This meant that Cassiopeia had insulted the gods with her boast. The Nereids begged Poseidon to punish Cassiopeia. Poseidon sent flood waters carrying a sea monster (in some versions named Cetus) to destroy the kingdom. An oracle told Cepheus that the only way to appease Poseidon and save the kingdom was to sacrifice Andromeda to the monster. Andromeda was chained to a seaside cliff to be eaten by the monster. Perseus, a son of Zeus and a mortal mother, was on his way home from carrying out his pledge to destroy the Medusa. He saw Andromeda in peril and instantly fell in love with her. He offered to destroy the monster, rescue Andromeda, and save the kingdom in return for her hand in marriage. Cepheus and Cassiopeia agreed reluctantly (having already promised her to someone else). Perseus killed the monster and freed the princess. Andromeda insisted on keeping the promise made by her parents and married Perseus. As a reward, the goddess Athena (who had been helping Perseus to defeat the Medusa) placed an image of Andromeda in the stars. 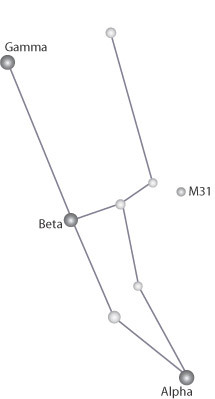 The basic constellation is in the shape of an "A" with a star representing Andromeda's head at the point of the "A". Some versions are more elaborate, tracing her outspread arms chained to the cliff.